What is shown in the image above? If a eukaryotic cell has 20 chromosomes and it undergoes meiosis, how many cells will result, and how many chromosomes will they contain? You have homologous pairs of chromosomes in each of your cells. In what way are these pairs of chromosomes similar? They have exactly the same genes. What process produces genetic diversity through random distribution of maternal & paternal chromosomes(meaning they can line up on either side of the metaphase plate)? From the list below, which choice represents a correct difference between sperm production and egg production? Sperm are produced by meiosis; eggs are produced by mitosis. Four mature sperm are produced from one cell; one large egg is produced from one cell. Complete each statement with a word from the word bank below. BE SURE TO SPECIFIY IF THE STAGE IS OCCURING IN MEIOSIS I or MEIOSIS II!!! An organism has 38 chromosomes in a body cell. After mitosis each cell has 38 chromosomes. After meiosis each gamete has ____________________ chromosomes. An organism’s gametes have ____________________ the number of chromosomes found in the organism’s body cells. At the end of meiosis I, ________ daughter cells are created. At the end of meiosis I, the daughter cells created are DIPLOID or HAPLOID? Short Answer: Answer the questions below using sentences, a model, or bullet-point list. Why does meiosis have two cell divisions? (HINT: Think of chromosome number) Why is this important for reproduction? Explain why the daughter cells produced by meiosis are genetically different from each other, whereas the daughter cells produced by mitosis are not. What two major events occur during meiosis that give the new cells genetic variation? When does meiosis occur in girls? In boys? Label the phases of Meiosis (be sure to be specific with I or II). Open the image below and insert text into the numbered boxes by clicking the "T" button on the toolbar to the right. Though the stages of meiosis have the same names as the stages of mitosis, they exhibit fundamental differences. What are the main differences between the two processes? Meiosis differs from mitosis in that the number of chromosomes is halved and genetic variation is reduced in meiosis, but not in mitosis. Metaphase and telophase portions of meiosis and mitosis are the same. Meiosis and mitosis are also the same, except for the number of chromosomes. Anaphase I and anaphase are different. Prophase and telophase portions of meiosis and mitosis are the same. Meiosis II and mitosis are also the same and have the same number of chromosomes. Anaphase I and anaphase are different. 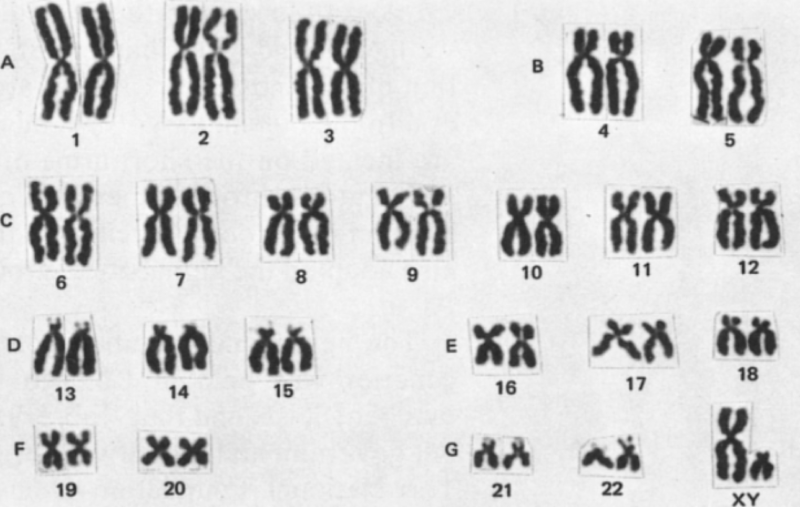 What can you tell about the person that this karyotype is from? Choose ALL that apply. In general, chromosomal mutations usually have much more serious consequences than single gene mutations (point mutations, frameshifts, etc). Explain why. 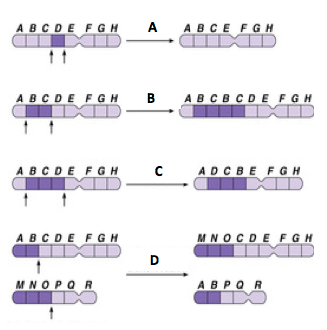 Identify each type of the chromosomal mutations in the image above. Use the "T" option to enter a text box.